In some instances, there may be a significant level difference between the incoming pipe and the invert level of the manhole. 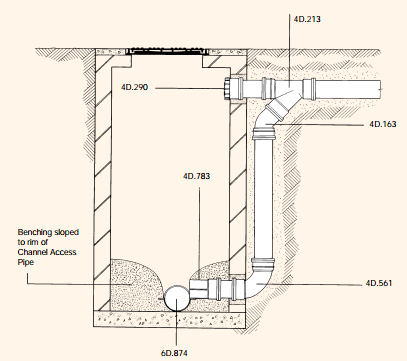 To accommodate this, and to avoid having to excavate to full depth for the incoming pipe, a Dropshaft connection may be used. 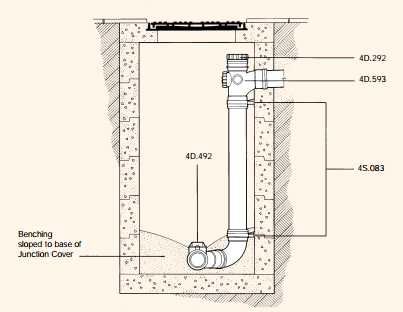 A backdrop to a manhole is a method of connecting two substantially different drain line invert levels in a manhole. This can be done either internally or externally by using the following 110mm or equivalent 160mm fittings, as follows. For an internal backdrop, use a Socket Plug (4D.296) or a Screwed Access Cover (4D.292), plus an Equal Access Junction (4D.593), vertical pipe to suit, a Short Radius Bend (4D.161) and a Channel Branch Bend (4D.782/3) or a Sealed Access Fitting to suit (see Figures 37 and 38). 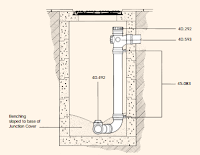 Fix internal vertical pipe securely to the manhole wall with OsmaSoil Brackets (4S.083). 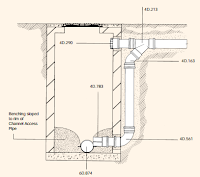 For an external backdrop, use a Screwed Access Cover (4D.290), plus a 45° Equal Junction (4D.213), a Short Radius Bend (4D.163), vertical pipe to suit and either a Long Radius Bend (4D.581), or a Short Radius Bend (4D.161) plus a short length of pipe connected to either a Channel Branch Bend (4D.782/3) or a Sealed Access Fitting (see Figure 38). Alternatively, ramped backdrop can be used, for drops of less than one metre, by means of two Long Radius 45˚ Bends (4D.583) and a raking length of pipe.